America’s urban terrain has not exactly seen an explosion in high-density development since introduction of LEED for Neighborhood Development (LEED-ND), an innovative neighborhood-wide sustainability rating system pilot program launched in 2007—just as the Great Recession was about to dig in. With the economic downturn laying waste to so many best-laid plans, it is no great surprise that activity has been slow to emerge in districts pursuing certification under the Leadership in Energy and Environmental Design (LEED) program, developed by the U.S. Green Building Council, the Natural Resources Defense Council (NRDC), and the Congress for the New Urbanism. Nevertheless, a few proverbial green shoots of adaptive use and redevelopment activity have budded in LEED-ND-registered neighborhoods across the country. And chances are that they are providing a glimpse of some of the 21st-century housing alternatives that lie ahead as economic recovery allows more mixed-use residential development to pencil out in sustainability-minded districts. 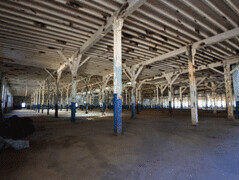 Updates of early activities in three LEED-ND pilot participants—the Brewery in Milwaukee, Wisconsin; the SALT District in Syracuse, New York; and Tassafaronga Village in Oakland, California—demonstrate that pilot projects have plenty in common but offer considerable contrasts as well. A common characteristic of initial activity in these three districts is that obsolete or blighted properties are being transformed into functional homes and nonresidential spaces heavy on sustainable elements. For instance, Tassafaronga’s living units are designed to achieve a Platinum rating under the LEED for Homes program, while the Brewery’s comprehensive neighborhood development plan is certified Platinum under the LEED-ND pilot. The Olympic and Paralympic Athletes Village in Vancouver has been certified as the greenest, most energy efficient and sustainable neighborhood in the world for 2010. The Olympic Village was awarded the LEED (Leadership in Energy and Environmental Design) ND stage 2 platinum certification by the U.S. Green Building Council (USGBC). Developments at all three sites take a conservation-minded approach to stormwater retention. And early projects at both Tassafaronga and the SALT (Syracuse Art Life Technology) District use photovoltaic solar arrays to produce power on site for apartments. The three incorporate considerable open space, including parks, plus transit-convenient, urban infill locations. The emphasis on sustainable practices and conservation means a lot to residents and merchants, says Maarten Jacobs, director of nonprofit Near Westside Initiative (NWI), a primary sponsor of SALT District environmental endeavors. “It draws certain residents and businesses who appreciate that we’re trying to do everything as sustainably and green as possible,” he says. 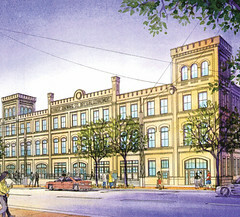 With financial seeding by Syracuse University, NWI developed the SALT District’s inaugural residential mixed-use project—conversion of the historic Lincoln Supply building to provide lofts and commercial space. As is the case at the other two projects, much of the housing being created at Lincoln through renovations and new construction is targeted at specific demographic groups—and is mostly affordable. Initial projects at Lincoln and the Brewery are designed to attract artists and other creative people with open loft configurations featuring studio and related live/work spaces. The next planned residential projects coming to the Brewery are aimed at seniors through suitable design and amenity packages. The residential developments combine market-rate residences with units subsidized to varying degrees to make them affordable for moderate-income renters and buyers. Some projects have qualified for low-income housing tax credits, tax-exempt housing revenue bond financing, or both—and in some cases, historic preservation tax credits. LEED-accredited architect Eliot Allen, a principal at Criterion Planners in Portland who has been involved in certifying LEED-ND projects since the program’s inception, says he is not surprised that affordable housing has been such a focus to date given the state of the nation’s economy. Indeed, the three featured developments are representative of the very few pilot LEED-ND projects that garnered development approvals before the recession: they managed to secure financing mostly for subsidized mixed-income rentals, he notes. Though plans for a lot of other pilot projects include considerable affordable housing elements, that does not mean market-rate housing components will not play an equally prominent role as the economy improves, Allen emphasizes. Many inaugural residents of these new communities also get easy access to services from public agencies and nonprofits, including providers of health care, and employment and educational assistance. Such on-site resources are particularly prominent at Tassafaronga and the first SALT District renovation venture. Developers pursuing individual projects at the Brewery get the considerable benefits of a historically unified 21-acre (8.5 ha) site. An entity involving the city and a group formed by a philanthropic local developer is strategically parceling off the seven-block former Pabst Blue Ribbon complex, including a couple dozen registered historic structures. In California, the longtime ownership by the Oakland Housing Authority (OHA) of the former blighted project underlying most of the 7.5-acre (3 ha) Tassafaronga site has helped its mostly multi­housing redevelopment plan progress. OHA-affiliated entities continue to control the bulk of the multiphase venture—the exception being 22 owner-occupied homes built through the local chapter of Habitat for Humanity. In contrast, the SALT District project just west of Syracuse’s central business district covers a diverse 156 acres (63 ha) of mostly older homes, commercial and industrial buildings, vacant lots, a central school and park, and other properties—and with more than 8,000 residents. But the fact that the SALT plan achieved a Gold rating under the LEED-ND pilot illustrates yet another critical characteristic the development has in common with “Tassa” and the Brewery—an easily accessible urban infill location. Allen points out that the locational context, including access to multimodal transit alternatives, can account for as much as a third of a candidate project’s qualifying LEED-ND score. Here is a closer look at the Brewery, SALT District, and Tassafaronga Village. Just adjacent to downtown, the historic Pabst Brewery gets a rethinking. Sandwiched between Interstate 43 (North–South Freeway) and the Milwaukee River immediately west of Milwaukee’s downtown core, the Brewery has seen a flurry of improvements even as the recession idled many other plans. The activity goes well beyond the residential component: former Pabst structures have been converted into offices, shops, and gathering places, as well as lofts, and more commercial, hospitality, and living spaces are in the near-term pipeline. Master developed by an entity founded by late local developer and philanthropist Joseph J. Zilber, the Brewery is slated for more than 300 residences and 1.3 million square feet (121,000 sq m) of business space at the Pabst complex that shut down in 1996. After environmental remediation and construction of a 900-stall parking structure, it already appears to have captured more development activity (consisting, for the most part, of renovations) than any other LEED-ND project. 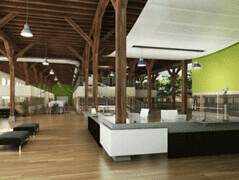 As plans progressed, the solid existing infrastructure, strategic infill location, and cool historic structures made the Brewery one of barely a handful of LEED-ND pilots “that immediately caught my eye as projects with exceptional potential,” blogged Kaid Benfield, director of sustainable communities with the New York City–based NRDC and cofounder of the LEED-ND rating system. 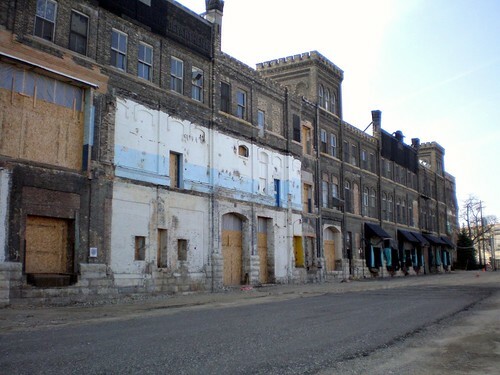 As Benfield notes, Milwaukee’s Common Council amended the Brewery project’s development incentive zone guidelines in 2008 to require numerous sustainable practices, many of them drawing on LEED-ND concepts, including heat-island reduction, water efficiency, and stormwater management. The 95-unit mixed-income Blue Ribbon Loft Apartments project has been operating for three years, and now some subsidized seniors’ housing projects are preparing to add to the Brewery’s permanent population. The $16.2 million live/work lofts, created from the Pabst complex’s former keg house, are home to artists and other creative types of people. Designed in-house and developed by Oregon, Wisconsin–based Gorman & Co., the Blue Ribbon project has a music studio, an art studio, a workshop, a performance space, a fitness center, and a community room. Some of the lofts have roll-up doors that increase public access to the tenants’ businesses. The project qualified for $9.1 million in low-income housing tax credits as operators made 69 residences available to families and individuals making 50 to 60 percent of the area median income. Already joining Blue Ribbon are several commercial renovation ventures carved out of historic brewery facilities. The former boiler house is now a 40,000-square-foot (3,700 sq m) office building that is home to architects, lawyers, and other professionals. Renovated brewery offices are occupied by Cardinal Stritch University’s College of Education and Leadership, and other tenants. The former Pabst visitors’ center now serves as a tavern (naturally), banquet room, and gift shop. Also in the works are adaptive use projects designed to provide hotel space and housing for seniors. Some of the seven blocks are ready for ground-up construction as well. For instance, CommonBond Communities is planning a mixed-income housing project for seniors that will have about 48 units and be financed in part with tax-credit equity. Directly west of Syracuse’s central business district, the SALT District qualified for LEED-ND designation in part because of stakeholders’ commitments to walkable streets, compact development, and mixed-use buildings. It also includes a school, Blodgett Elementary, and a city park, Skiddy Park. The pace of redevelopment here has been painfully slow since the start of the recession. But sponsors can point to nonprofit NWI’s $4 million adaptive use of the century-old Lincoln Supply warehouse along Otisco Street as a meaningful neighborhood improvement demonstrating numerous sustainable features and practices—and providing attractive new housing alternatives. Ten spacious and efficient live/work lofts occupy the top two levels of the four-story building; public and private organizations lease offices on lower floors. Renting for $1,075 to $1,225 (comparable to other apartments in and near downtown), the lofts range from 1,120 to 1,275 square feet (104 to 119 sq m) and appeal to artists, teachers, and others amenable to downtown living and loft-type spaces, Jacobs notes. This two-story house transforms a typical gabled roof into a simple folded surface that recalls the appearance and scale of neighboring houses. Its flexible layout accommodates two, three, or four bedrooms within the same shell. The passive solar strategy utilizes a well insulated envelope, airtight construction, an efficient small heating system, controlled ventilation, and windows that optimize solar gain, requiring a negligible amount of heating energy. “These spaces are very different from traditional apartments,” Jacobs says. Designed by Chicago-based Brininstool + Lynch, they are true loft-style residences, with nary an interior door other than the bathroom. Baths share walls with kitchen areas and laundry closets, minimizing plumbing costs while separating sleeping areas from live/work spaces. Lincoln Apartments has a geothermal field featuring an array of about 20 tubes running as much as 300 feet (90 m) below a parking lot. The renovated Lincoln building also features solar photovoltaic panels, a stormwater retention system, and a “living wall” shading device composed of vines on trellises covering portions of two facades. Jacobs expects to receive a LEED Gold rating for the project. The ground floor is occupied by the 5,000-square-foot (465 sq m) La Casita Cultural Center, a Hispanic-oriented operationfounded by a pair of Syracuse professors with start-up funding from the university. City and school district operations lease the second floor, including the local affiliate of the Say Yes to Education foundation. The nearby Case Supply facility is an even larger adaptive use venture, slated to house the literacy organization ProLiteracy International, as well as regional public television affiliate WCNY. The site in eastern Oakland’s Elmhurst neighborhood now offers 157 sustainably developed rental units, 22 owner-occupied residences (thanks to Habitat for Humanity’s involvement), and support agencies. The community, designed by San Francisco’s David Baker + Partners, replaced a heavily blighted 87-unit public housing project. In addition to Tassa’s comprehensive stormwater filtration system, solar arrays are scattered through the site and the apartment building has a living roof. The 157 Oakland Housing Authority homes have qualified for LEED Platinum certification. Though apartment buildings and townhouses account for the community’s 137 new-construction residences, adaptive use is part of the Tassa plan as well. A converted pasta factory now provides 20 apartments for needy residents. Also, the city’s housing authority contracted with the nonprofit Project Access NOW organization, which coordinates a network of volunteer health care professionals who offer family services from renovated commercial space. To help diversify density, the planning team located the densest residential building near a corner of the 7.5-acre (3 ha) site and spread less dense family-sized townhouses over other blocks, notes OHA project manager Bridget Galka. The site plan provides natural integration into the surrounding community—including a neighborhood park, a library, and an elementary school—to a far greater degree than did the plan before redevelopment, Galka says. Indeed, the community no longer has any gates because the public is welcome to use the open spaces. Not surprisingly, given demand for affordable housing in the expensive Bay Area, applications to lease outnumbered units, with all occupied shortly after completion, Galka says. Renters holding project-based Section 8 vouchers account for 99 of the units, with rents set at 30 percent of resident income. Rents for other units, set according to tax-credit-program formulas based on local income levels, generally range from $785 for a one-bedroom apartment to $1,120 for a three-bedroom unit. National Equity Fund invested $25.3 million in tax-credit equity toward Tassafaronga Village’s overall $75 million cost, which does not include the owner-occupied units. Among other financing layers are revenue from the sale of state housing bonds, state housing loan programs, a state infrastructure development grant, city redevelopment funds, and OHA’s own reserve funds. Now that Habitat’s last phase of homes has been completed, it is time for OHA to apply for Stage 3 (completed project) LEED-ND certifi­cation for the entire Tassafaronga Village development, Galka says.